I smell really good today. And that’s a relief, because through pregnancy, and now nursing, my hormones have been all over the place– making my body odor more, um, pungent than it used to be. I feel like I’m reapplying deodorant all the time! I stopped using antiperspirants a long time ago, but I’ll admit that it’s been a struggle to find a non-toxic deodorant that really works. My favorite store-bought brands to date have been Schmidt’s and Primal Pits, but they can be a little pricey compared to the mainstream varieties. That’s why I’m so grateful to have found this easy recipe for making deodorant at home, using only all-natural ingredients. If you’ve tried making my homemade lotion before, you probably already have the ingredients you need on hand! This particular recipe comes from Sophie Uliano’s new book, Gorgeous for Good. 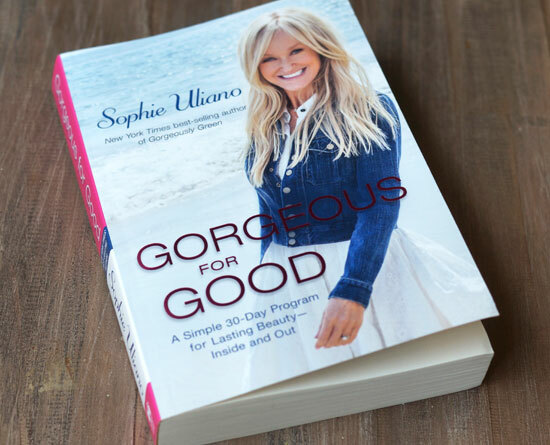 I love this book because Sophie includes plenty of well-researched, myth-busting information about commercial and natural beauty products, along with simple guidelines for buying the best skincare products, and money-saving recipes you can make at home, too. In this book she’s laid out a detailed 30-day plan, with step-by-step beauty, nutrition, movement, and self-care exercises to do each day. It’s an easy, doable way to jump-start your routine, no matter how busy you are! Thanks to Sophie, for allowing me to share this recipe from her book with you all. If you’ve already purchased Sophie’s book, be sure to take advantage of the bonus cooking video series she’s created, too! Place the coconut oil and the shea butter in a double boiler over low heat and stir until it has all melted. 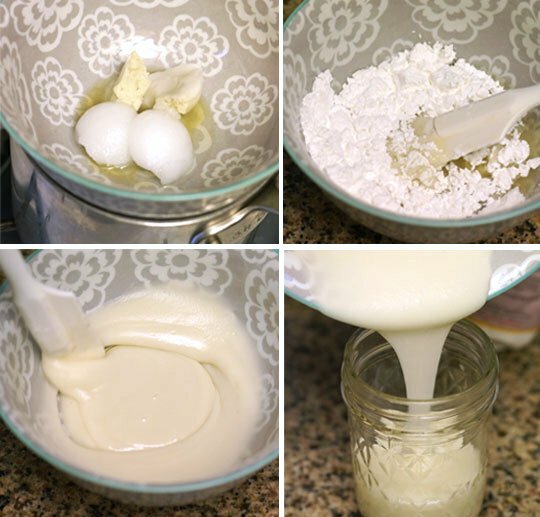 Remove from the heat and whisk in the baking soda and the arrowroot powder. Stir in the essential oil and then pour into the jar. At room temperature, the deodorant will be soft; if you want it to be more solid, store it in the fridge. Store in a cool, dark spot and use within six months. Note: Feel free to use any other favorite essential oils you like to create your own unique scent. I accidentally added an extra 2 tablespoons of arrowroot to the mix (got distracted by my toddler) and my deodorant still turned out great, so this recipe is also pretty forgiving! Hope you love this deodorant as much as I do! Reader Feedback: Do you make any of your own body care products? I get a horrible rash when using any kind of deodorant with baking soda. Do you have a good alternative that works just as well? I used so many different “natural” deodorants and always get a bad rash (actually, it’s full on open sores). Hi, I would like to ask if will this stain on my clothes? like leave a stain mark on it when I apply it? I haven’t noticed any staining myself, but it might vary by fabric? I always got white marks on my clothes with traditional deodorant, but I haven’t noticed it as much with the more natural options. Are you aware that regular baking soda has aluminum in it? This recipe does not specify whether it uses the traditional BS or non-alum. When I was making my deodorant with baking soda I would only use non-alum BS. I no longer use baking soda in my deodorant as it leaves burn/welt marks after about 2 weeks of application. I now make mine substituting DE instead. Works fabulous. But please..if you do not react to Baking Soda…use only the non-alum. After all, isn’t the aluminum in antiperspirant the reason we stay away from it and want to make our own? Do you have a link to that information? This article claims otherwise, but I’d love to read more if you have it. I was told that years ago and hoax or no hoax, all of our health food stores in town have baking soda in bulk, 2 bins, one with aluminum free on the label the other without..I err on the side of caution and ONLY buy the one that specifically says aluminum free. Megan, is it possible to leave out Baking Soda?? I have also gotten a rash in the past with homemade deodorant. Michele. I use DE diatomaceous earth in lieu of BS. The DE will darken the deodorant but I find that it does not stain clothing. Also BS has aluminum in it so you should look for the non-alum baking soda. Sophia @ Pray. Work. Eat. I’m so excited to try this and love that it is firmer in consistency compared to many other recipes I’ve seen. Thanks for sharing! Curiously, baking soda is irritating to some people but not at all to others. I make my own deodorant and have found that if I shave at night and apply a natural healing cream afterwards, it seems to help prevent any kind of irritation. Another thing you can do if you’re sensitive to baking soda is to wipe under your arms with diluted apple cider vinegar and then let it dry prior to applying a deodorant with baking soda. This helps to balance the ph, which may be what is causing the irritation. Ive just finsiehd first jar of Schmidts And loved it anD no IRRITATION but know friends got raSh or dark skin from it and had to use sensitive Version. Ill try this for sure!! Can I use cocoa butter instead of Shea butter? I don’t have any Shea butter on hand right now. I make a very similar deodorant that works great, just no shea butter, and cornstarch instead of arrowroot. I use a little tea tree oil and lavender oil. Glad to hear that I’m not the only one who’s gotten stinkier since having a baby. I’m shocked when I wake up in the morning with a stinky pit- but it’s just on one side! So relieved to hear Im not alone in only sweating from one arm pit! I thought there was something wrong with me! Never made deodorant and been looking for another alternative ‘safe’ shop bought one but I’ll give this recipe a try but without the backing soda as I have very sensitive skin. 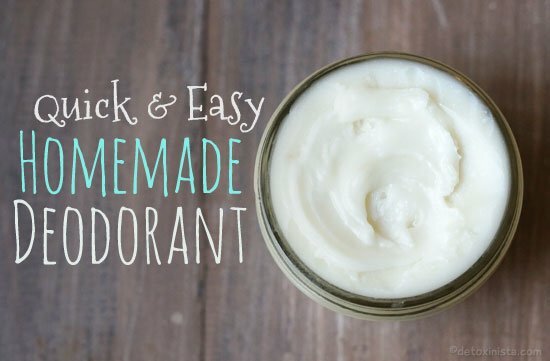 ive never tried homemade deodorant before, nor used a natural one, but I’m intrigued by this recipe. I hate the smell of commercial brands & the marks it leaves on my clothes. I also am nursing right now (baby #2) and I’m also super stinky! I’m glad to hear I’m not the only one. Stupid question – do you apply this deodorant with your fingers & then let it soak in? Yes, you just rub it in with your fingers until it dissolves/absorbs. I’ve been making my own deodorant for about two years now. Prior to this I began buying other people’s homemade lotions on Etsy. Definitely prefer arrowroot and baking soda combo as it is not as grainy. It hot summers in the desert you have to refridgerate, but it feels great when you apply it cold in that weather. Looking forward to trying this recipe. Yeah! I’m in the same boat. I cannot use homemade deodorant with baking soda. It is highly irritating on my skin. What would be a good substitute for the baking soda? I got a rash from any amount if baking soda, so I started using just arrowroot powder or organic cornstarch. I have a jar with coconut oil mixed with a few drops of tea tree oil and a jar with the powder mixed with a touch of lavender and tea tree. Apply coconut oil with fingers, let set for a bit and then dust with the powder. Love it! I have read that Lavendar is a no no under your arms as it does something to the glands and you can get lumps. Have you ever heard this? Lavender is an extremely powerful phytoestrogen so, Amber, you are right to be cautious. I stay away from it in any shape or form, but especially the essential oil as it’s so concentrated. using less baking soda helped me and was still effective. The coconut oil and bakingsoda version caused me to break out in a red rash. A mix of 100% aloe gel, coconut oil, with hazel, baking soda and essential oils works perfect for me. I am curious to try the version meagan posted. When I run out of my current batch i’ll whip it up. Do you mean “witch” hazel? Thanks for the recipe, Megan. I’ve been playing around with homemade deodorants for several years but haven’t tried shea butter yet. Does anyone else have a problem with periodic irritation from their homemade concoctions? I’m wondering if the baking soda is just abrasive enough to cause this, as my skin is somewhat sensitive. I made my own deodorant with a recipe similar to this, and found it terrible on my skin! After some research, I found out it was definitely the baking soda, it is way too abrasive for me, so I found other recipes that just use arrowroot powder instead! Yes, I make my own deodorant powder and get irritated if I add too much baking soda. In that case, I just mix in more arrowroot. I use only those 2 ingredients and powder puff my underarms after swiping them with coconut oil. I love effective homemade body products! I’ve actually heard from alot of people that the baking soda in their homemade deororant caused that. I was curious to hear if anyone else has this problem or if certain ratios worked better for them. Yes my husband gets redness in his pits when using my homemade deodorant, which is very similar to this one. I am so excited for this! Thank you for sharing. I was paying $14 a bottle for “safe” deodorant from Sephora. A crazy expensive price! Having 2 children has absolutely raged my hormones and quite honestly, I smell terrible. I used to never sweat, I know, crazy, before having kids and now with my hormones at times, wake up soaking wet in the morning. It’s insane! Not to mention that any woman dealing with secondary infertility, (or infertility in general) Oh my goodness, I can’t tell you what the drugs they put you on does to your body. And because your body is so sensitive, you cannot risk using any product on your body with any sort of chemical in it. You have to do SO VERY CAREFUL. I thought I was doing “ok” avoiding chemicals yet I have so much further to go. 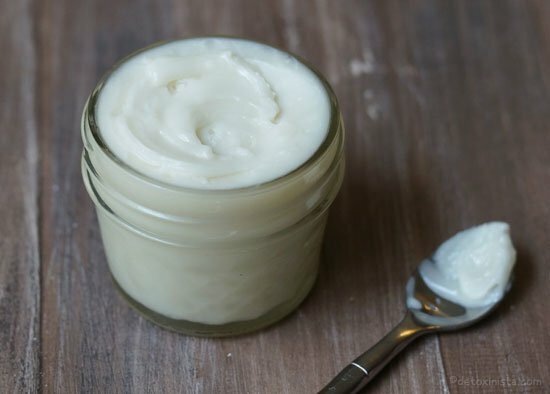 I make my own deodorant but have tried putting shea butter in it so will need to give this recipe a bash to see if it improves it – thanks Meagan!